Ahead of their appearance at Slam Dunk this year, we spoke to Loathe‘s Erik Bickerstaffe for a better idea of what we can expect from their set, this year’s fantastic lineup, what tracks they’re excited to play at this year’s festival and more. MOSH: You’re playing Slam Dunk for the first time this year – what are you expecting from your appearance at this year’s festival? EB: For Loathe, Slam Dunk has been a goal since our inception so it’s extremely gratifying that we are now getting the opportunity to play this year. It’s very exciting for us as a whole but also humbling being given the chance to play alongside some great acts on the Impericon stage such as The Devil Wears Prada, Counterparts and Comeback Kid. We are expecting 3 days of great music surrounded by great people, and we couldn’t be happier to be a part of it. MOSH: What is your favourite part of playing a festival vs. a gig? EB: Performing at a festival as opposed to a club show is definitely a different experience for our band. We love the atmosphere a dark room gives off, which is pretty standard for any Loathe show but playing a festival can force you out of that comfort zone. It’s sick, it’s just different. Also with a huge line-up, much like the one for this year’s Slam Dunk, it gives you opportunity to watch bands perform that you wouldn’t necessarily get to play with usually. MOSH: How do you go about switching up your setlist for festivals? EB: Usually we determine our set list by choosing whatever we enjoy playing live mixed with what songs go down well with the crowd. So for festivals its easier, as for us, at our level, the set time length we are given isn’t as extensive as other acts playing the festival. So choosing 5/6 songs is easier than preparing, say, a headline set. 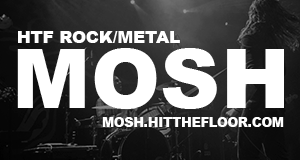 MOSH: Do you have any new tracks/ particular songs you are excited about playing live? EB: Earlier this year we released a split EP with our friends in Holding Absence titled ‘This Is As One’ which features songs ‘White Hot’ and ‘Servant and Master’ which we have recently implemented into our set. It is very exciting for us as we view both songs as a solid foundation for the future of Loathe seeing the direction we are heading in. Along with our personal favourites ‘It’s Yours’ and ‘Dance on My Skin’ from the album ‘The Cold Sun’ our most recent set list is definitely our strongest yet. MOSH: This year’s lineup is amazing – who are you most excited to be playing alongside/ hoping to catch? EB: As stated earlier, The Devil Wears Prada, Counterparts and Comeback Kid are notable bands we are all excited to watch on our stage. Aside from that Jimmy Eat World is a band I personally am very excited to watch, hopefully, every night. MOSH: Using only the bands on the lineup this year, can you create you dream tour? EB: Hmm, well. To be quite honest, a tour of the entire Impericon stage would be mad. So, that would probably be our dream tour comprising of bands involved in Slam Dunk 2018. MOSH: What are some of your best tips to surviving a festival? EB: I honestly have never been to a festival aside from playing them, but from what I have read in the past my tips would be to: Stay hydrated, divide your time up carefully so you don’t miss some essential bands and enjoy yourself. MOSH: What exciting things have you got lined up for the rest of the year? EB: New music, more extensive touring, seeing more of the world. A lot of exciting prospects to close the year out!